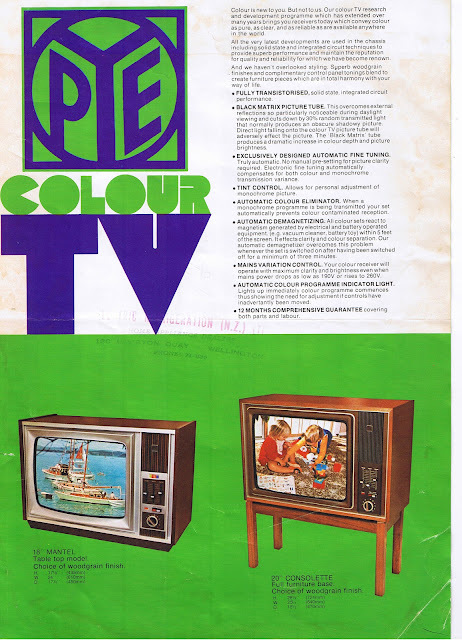 I recently got a box full of old television service information and whilst sifting through it all I came across these old colour TV brochures. 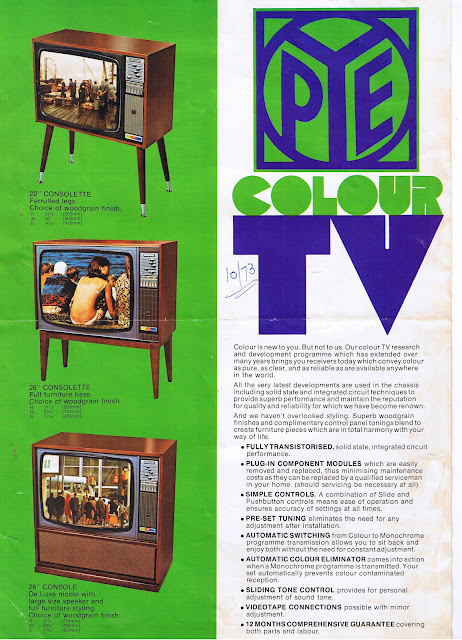 Any New Zealand TV set advertising I consider quite rare as most of sort of thing would have been disposed of many years ago. Just to note with the Pye brochure, the second side shows the re-badged Philips K9 sets and thankfully someone has written a date of 10/1973 on it. The two Pye sets on the first side are the early CT101 chassis, now virtually extinct. The other brochure showing the AWA Deep Image set were actually re-badged Thorn TX574/3500 chassis. This particular model is one TV I would love to come across as my earliest childhood memories were watching one of these but also now these have pretty much gone too. It wasn't very reliable though, I remember every month or so a white TISCO van would turn up and a man would come in, pull the back off and change a board which would get the thing going again for a while. It got nursed along until about 1982 when Dad decided one night after it died halfway through the news, that it was time to buy a new TV. Anything else I come across in the future like this will also be put here. Enjoy! Pye ad contextually misspells complementary "complimentary". How could client & agency both miss that? Yes the Thorn 3500's they were a nightmarish set, what let them down was the component quality. I know a retired TV tech who worked on these Thorns and actually made these sets quite reliable by using better quality components. And the 22 inch sets were better and gave a stunning picture apparently. 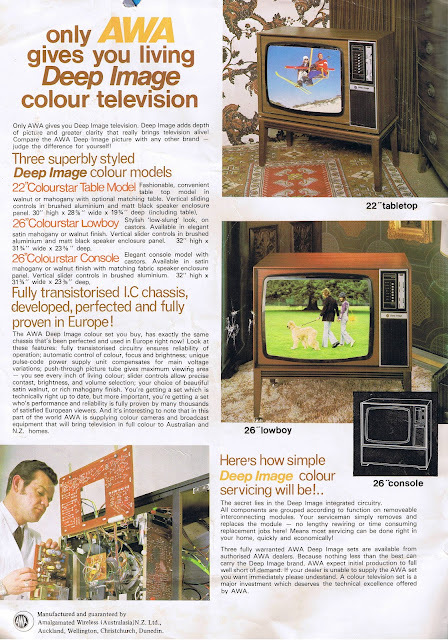 Pye spelling mistake almost as disastrous as quasinude model on screen picture and CHEAP cabinets with British-style "Press-Through-Presentation", as they called it, picture tube mounting style. Speaking of 1st generation color, HMV in Aust did a quite reasonable effort (not sure if these expensive sets made it to NZ). Totally agree with the comment that the 3500 could be made into a very reliable and good performing set with with replacement and upgrading of a few components. I used to buy them ex-rental, service and upgrade them and never saw them again. The 10 ohm wirewound on the convergence board and all the plastic encapsulated electrolytics were a must. I did hear of a nightmare chassis from a colleague who emigrated to NZ which we never saw in the UK, I believe it was based on the 9000 but driving a delta gun CRT complete with convergence board. The last I heard of him he had become a vicar so they must have been a horror.